GC Immigration Working Group: "Asians" fastest growing immigrant group in NYC. "Asians" fastest growing immigrant group in NYC. A very timely article on the heels of the recent Immigrant Queens: Defining Communities of Interest conference in March at Queens College. According to the article (and data from the recent census), Asians now number over 1 million in NYC. Since the 2000 Census, their numbers grew by 32%, making them the fastest growing immigrant group while Hispanics grew by only 8%, and non-Hispanic whites and blacks saw declines in their populations (-3% and -5% respectively). Yet, Asians tend to be the most politically under-represented group...Now that seems to be changing. Continue reading on the NYT site (and check out the super cool map). 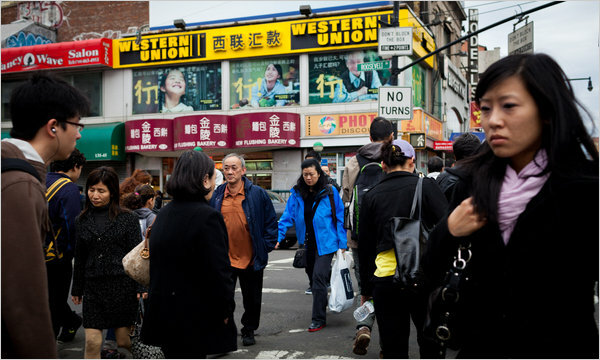 Flushing, Queens, is home to a large population of Asians, including Chinese, Koreans and Indians. Asians in the city are reaching across ethnic lines to gain political power. Census figures in April showed one million Asian New Yorkers, a milestone that has become a rallying cry.